Welcome to Chocotoberfest! 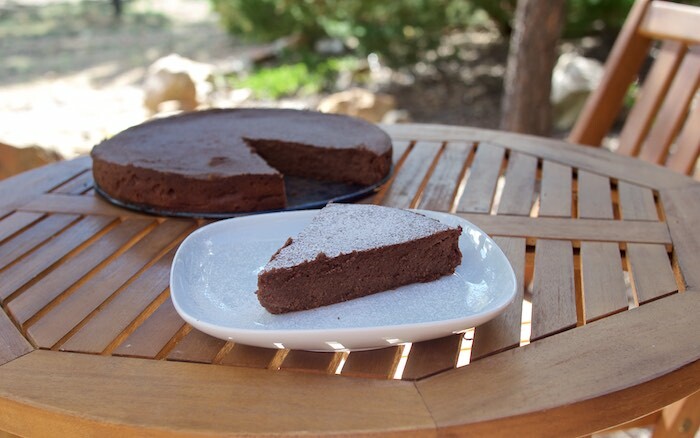 Today I am sharing a delicious gluten free chocolate cake. Ricotta cheese is combined with almond flour to produce a moist flavor chocolate cake that will be loved by all. This year's Choctoberfest is sponsored by Imperial Sugar, Davis Chocolate, Rodelle Vanilla and Barlean's. Be sure to check-back all week long for scrumptious chocolate recipes and enter the giveaway below! A little about our gold sponsor: Since 1843, Imperial Sugar has been at the heart of family traditions and celebrations. Imperial Sugar does not use genetically modified plants in any of our pure cane sugar products. Preheat oven 350. Grease & flour a spring form pan. Melt chocolate in the top of a double broiler. Add the ricotta, sugar, almond flour cinnamon & vanilla to the chocolate and stir to combine. Mix in the egg yolks. Beat the egg whites, in the bowl of a stand mixer, until you get soft peaks. Add the egg whites to the chocolate mixture and gently fold through until completely combined retaining as much air as possible. Spoon batter into cake pan and smooth top. Bake for 25-35 minutes, remove from oven and cool. Rich and decadent! Perfect chocolate indulgence!!! now thats a great ricotta cake! does it taste a little like a cassata all chocolate? Wow, I would love a slice of that deliciousness.